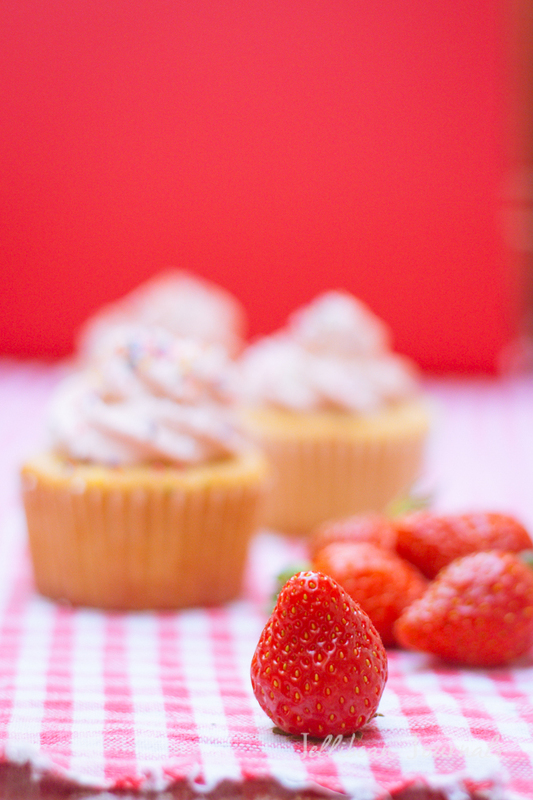 I was saving these cupcakes for summertime, when strawberry harvest is in full-swing and pool parties become a weekend norm. Then I decided that most of you are probably shuffling through snow-covered driveways trying not to catch cold and most likely need a dose of summer sunshine. What’s cheerier than a cream cheese pound cake cupcake topped with pretty pink strawberry Swiss meringue buttercream and sprinkles? Pound cake ranks high in my book. Aside from chocolate truffle cake, it’s the only cake I go bonkers about. 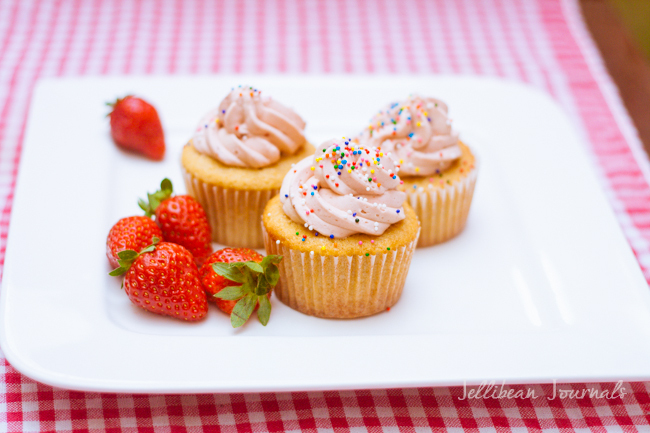 A few weeks ago I was craving dense, sweet pound cake and made these pretty sour cream pound cake cupcakes to share. 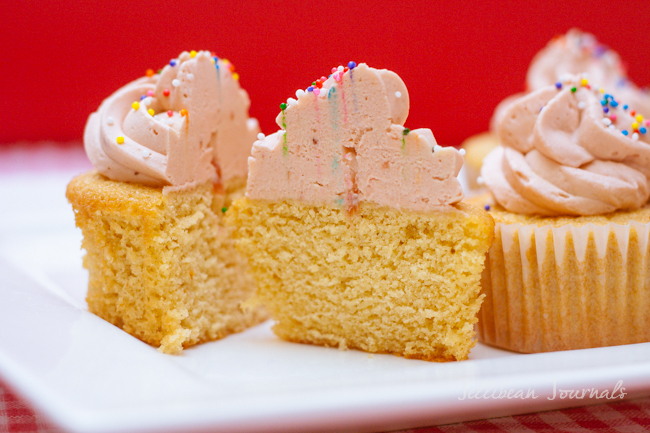 The cuppies are topped with a pink swirl of strawberry Swiss meringue buttercream. Stop drooling and pin this recipe, already! If you’ve never experienced Swiss meringue buttercream, you’re in for a treat. 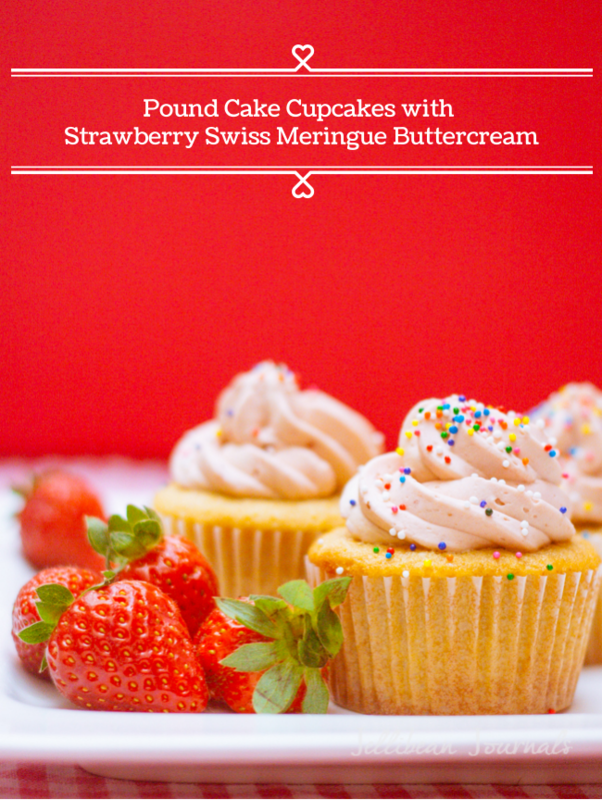 It’s smoother than typical American buttercream and melts in your mouth like, well… buttah. 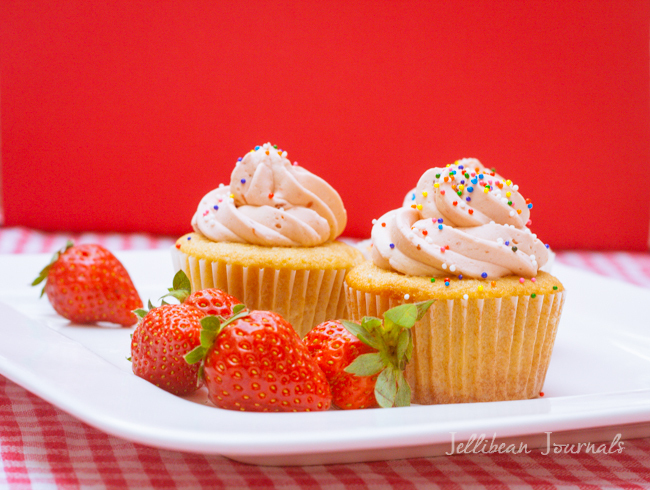 This strawberry Swiss meringue buttercream is made by whipping heated egg whites with sugar to form a meringue. We’ll then add butter and a liberal dallop of strawberry preserves to the fluffy meringue to finish it off. This buttercream pipes beautifully and holds up well at room temperature. If you’re new to piping frosting, start with this tip. I use it for everything and you can’t go wrong! Have you tried frozen cake? I have a strange frozen cake fetish, so my husband and I taste tested these cupcakes both freshly frosted and frozen. We both liked the buttercream even better frozen. Yeah, we’re weird like that. No matter how you serve them, these cream cheese pound cake cupcakes are delicious and well worth the effort. Gather your supplies and let’s bake! 1 bar (8 oz.) cream cheese, at room temp. Preheat oven to 350F. Prepare 34 cupcake tins with liners. Beat butter and cream cheese until smooth. Add sugar and beat 5 minutes or until fluffy, scraping down bowl once or twice. Add eggs one at a time and follow with vanilla. Reduce speed to low and add in half the flour along with baking powder, and salt. When nearly incorporated add remaining flour and mix only to combine. Fill muffin tins ¾ full and bake 20 minutes or until a toothpick removes clean. Remove from muffin tin to a cooling rack. Mix frosting as cuppies cool. Place egg whites, sugar, and salt in the bowl of a stand mixer and place over a bowl of simmering water. Whisk constantly until mixture reaches 160F. Attach whisk to mixer and beat the meringue mixture to stiff peaks on medium high. Beat until the side of the bowl feels neutral, no longer warm, approximately 10 minutes. Add butter, one tablespoon at a time and beat until silky smooth and luscious. If it gets soupy, don't despair! Keep on beating. If after 5-8 minutes your frosting is still runny, refrigerate 15 minutes and beat again. It WILL come together. Here is a tutorial for all you doubters. Reduce speed to low and add preserves and vanilla. Pipe onto cupcakes. Yum! I love the way they look, how cute & fun. I think you should send a couple over just so I can make sure they are ok for you guys to eat. ;P Happy Friday! Leslie, cupcakes wouldn’t travel so well overseas, or I’d be happy to send you a batch 😉 Thanks so much for your sweet note. Glad you stopped by today. Jenna, pound cake is a specific type of cake that is used to be made by combining a pound of butter, a pound of sugar, etc. Here’s more info if you’d like to study up on the origins. It is more dense than a typical white or yellow cake and intriguingly moist and flavorful by the addition of cream cheese. You’ve gotta try it! If you like light and fluffy frostings, you’re going to love it. What a fun little pool party treat this summer! 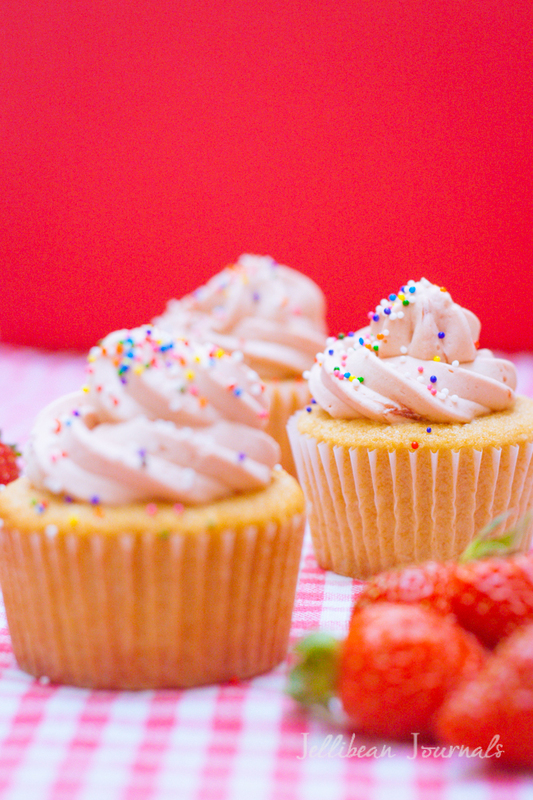 Loving how the texture looks so melt-in-your-mouth… and the frosting– delish! Love your pictures, Jelli. They look like the cover of a foodie mag! Gloria, you’re too kind. Thanks so much for stopping by and the sweet compliments. Hope you have a beautiful week. Oh, I think you forgot to list the butter amount in the ingredients for the buttercream. Gosh, thanks for catching that, Deanna. Sometimes I fly through the recipe so fast as I’m typing it in that I forget to jot it down. Thanks for noticing and hope you find time to make the cuppies too when wheat’s welcome at your table. Have a wonderful week. Um… so all I have to say is… YUM! Everything about these cupcakes just needs to get in my mouth now! Pinned! Krista, you always leave the sweetest and most giggle-worthy comments. Thanks so much for visiting me today. I really appreciate the pin too, of course! Take care, lady! How would this work as an actual cake? Which type/size pan would you use? I’m looking for a recipe for a birthday cake for my Mom and she sais she wants something spring-y and things fits the bill! Jami, this recipe comes from a pound cake that’s meant to be baked in 2 loaf pans. Just be sure to butter and flour the pan before pouring in the batter and bake it for 60-75 minutes until a toothpick comes out clean. You could opt to whip the frosting up and dollop it on top or on the side of the cake slices and add strawberries for garnish. These look so good they might need to be for my birthday. I am intrigued by this buttercream as it would be so much lighter. These are perfect for birthdays, Jennifer! The light frosting is so much more enjoyable than stiff buttercreams. In fact, you can use even less butter than I included in the recipe if you want more of a marshmallow frosting consistency. Thanks for visiting! Hello! I think this recipe is beautiful and looks really tasty! I am using your recipe to bake some cupcakes for my teachers for Teacher Appreciation Week. So far, the cupcakes themselves are fine, and are quite delicious. But the meringue butter cream is runny and doesn’t become stiff. I have done everything you said, looked up all the solutions for runny meringue butter cream and it still hasn’t come together for it to be a solid frosting for the cupcake no matter how long I beat and mix. Is my SMB a lost cause? Will I have to throw it away? Help me please! Nancy, I’m so sorry that your buttercream isn’t coming together. From my own experience, refrigerating it even up to 30 minutes and then whipping again for 8-10 minutes usually does the trick, but if you’ve done that already, then I’m not sure what might have gone wrong. I’d hate to say it, but you might just have to chuck the batch. Bummer. On a positive note, I’m really glad the cupcakes turned out well. I actually baked these for the teachers at our school too. Funny coincidence. 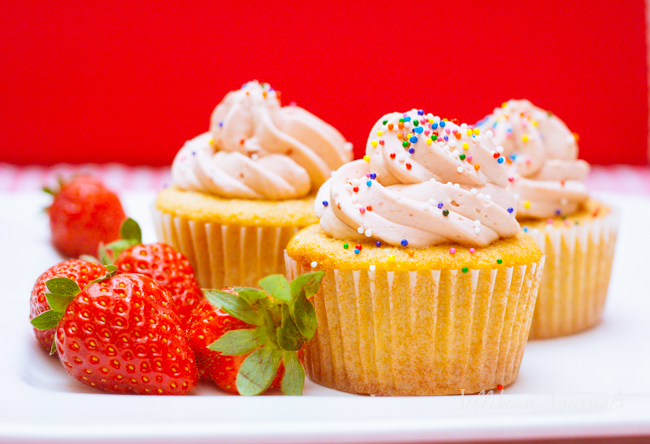 I only need about 1 dozen of these cupcakes … How would I go about it? Sure, you could cut it in half, or you could bake one loaf and one dozen cuppies. Hope this helps, Angie! Goodness, they’re so delicious! Hope you love them, Cheryl!